As a world leader in Hair Research, we are very excited about the new possibilities of using Stem cells, to treat hair loss. Over the past thirty years we have worked in Research and Development of all three FDA cleared modalities to treat Hair Loss. Now, there have been new breakthroughs in the field of Stem Cell Therapy. We are presently involved in a program to treat Hair Loss with the Body’s own cells. This new technology is totally safe, and FDA cleared for soft tissue injection. This procedure takes only about one hour, and hair growth typically starts around three months. 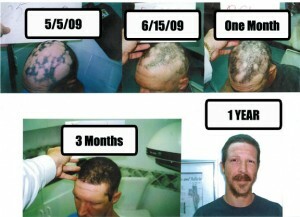 Enclosed is a photo of our patient, followed by a local Television News Broadcast, (covering his transformation over 1 year).